A house plan that’s high on design! 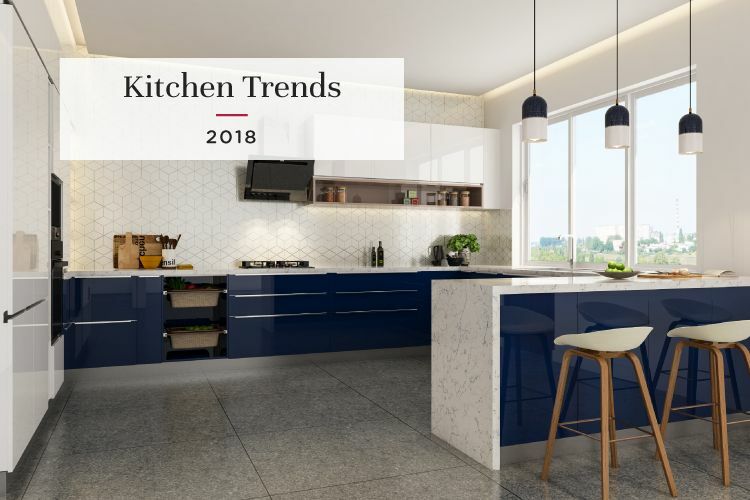 When people first approach an interior designer, the requirements are usually the same: functional spaces with space-saving or clutter-free designs and furniture. 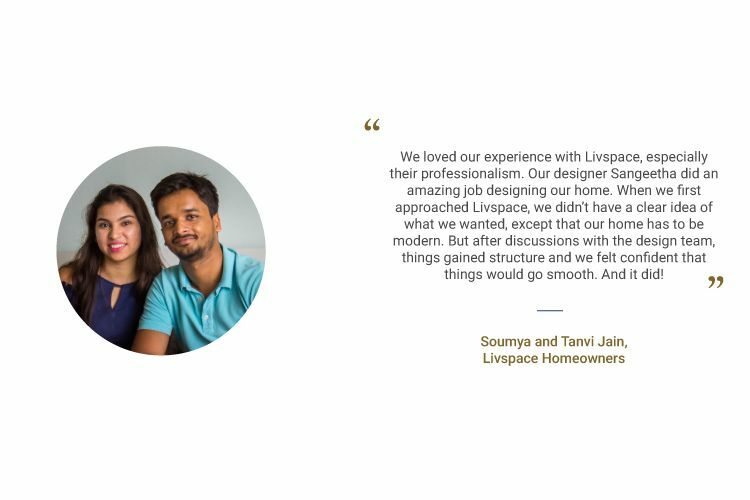 But Soumya Jain and his wife Tanvi wanted their brand new home at Eastwood Township in Harlur, Bengaluru, to be focused on design and comfortable living. The software engineer duo that has been married for three years revealed in a discussion with us, “Aesthetics are important to us. 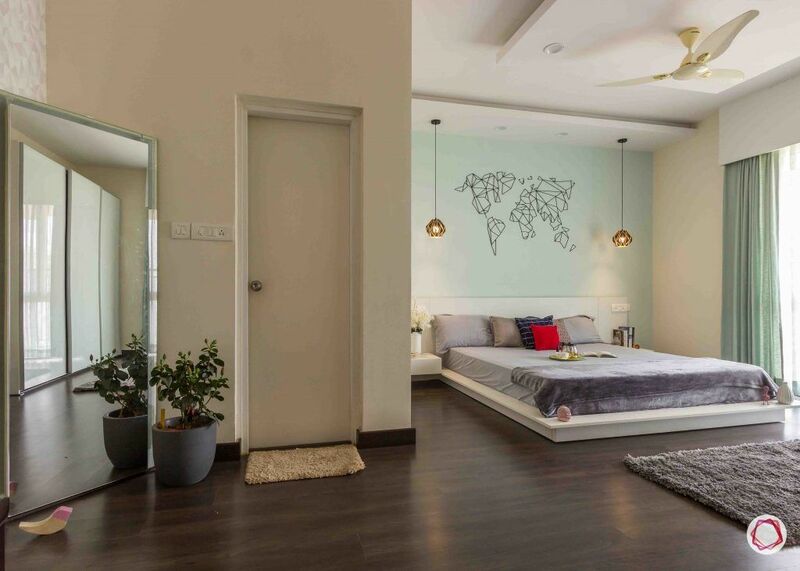 We want to feel happy in our space.” Our designer Sangeetha Rahael Raj readily obliged! 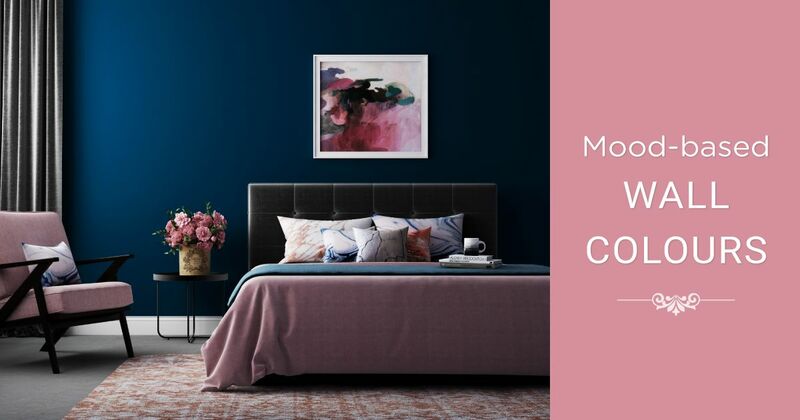 First impressions are everything, even if it’s for a home. 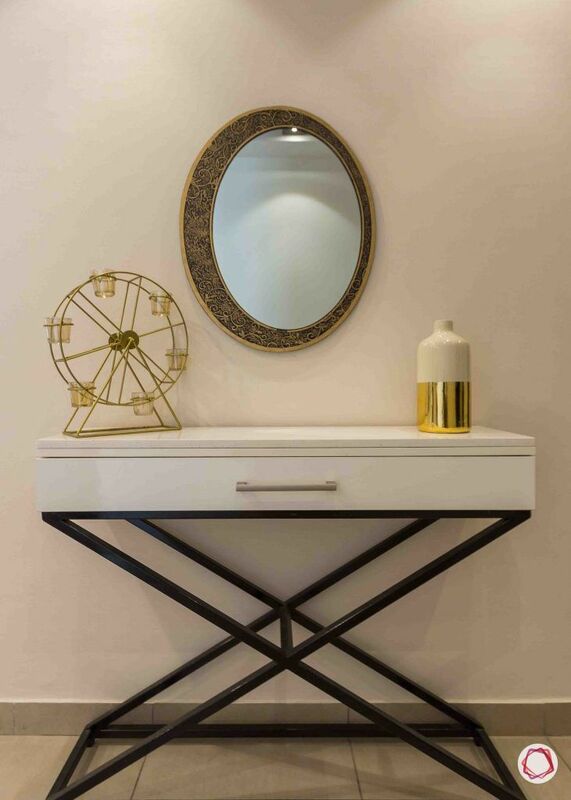 The first thing you would see in their home is a polished console table on criss-cross legs. 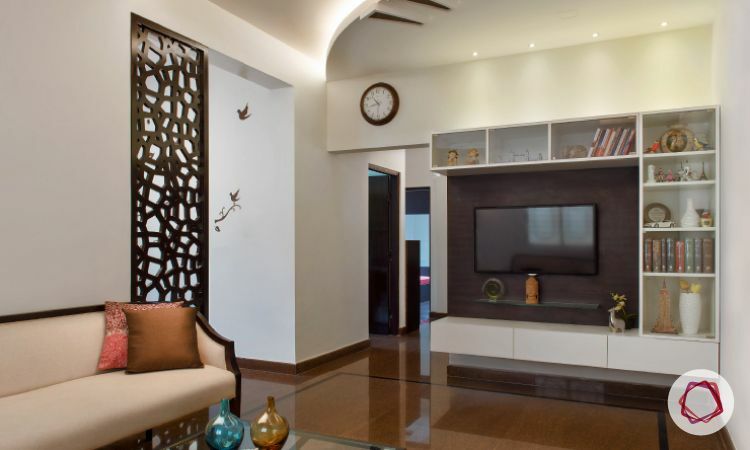 It’s been topped off with kalinga stone to add a lustrous touch. 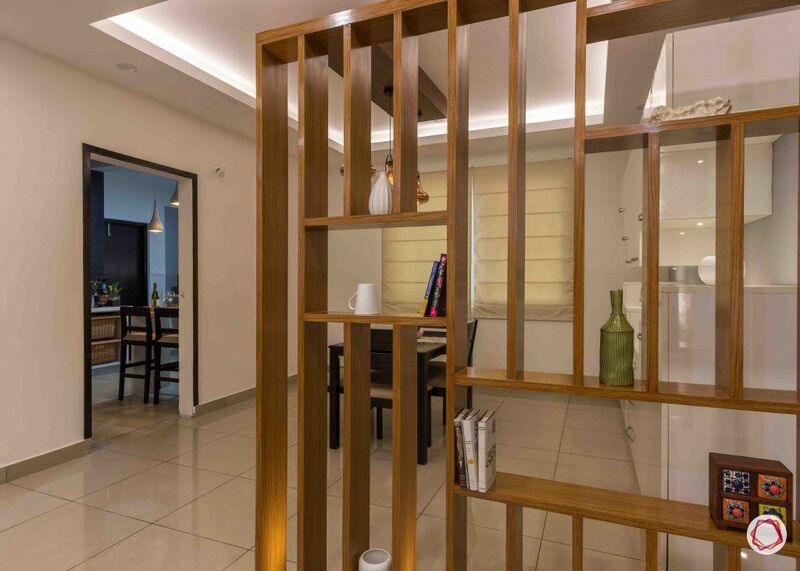 A 3D mirror adds a bit of dimension to the foyer space. The living room is a mix of elegant elements. 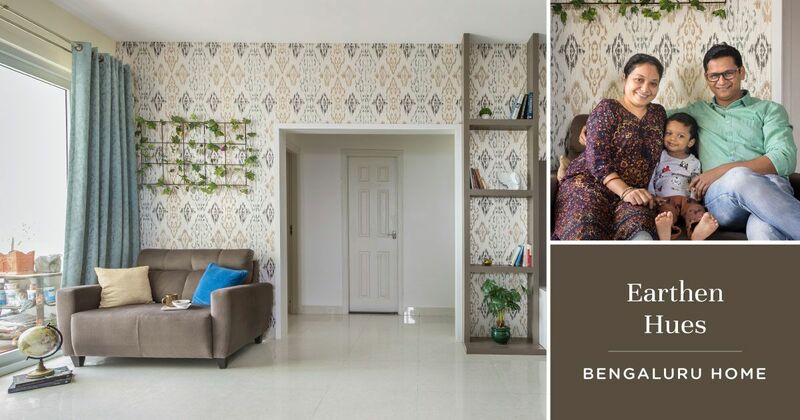 Your eyes quickly move towards the white tetris blocks on the wall that gives a glimpse into the family’s vibrant personality. It sits on a beige wallpaper with mild texture on it. 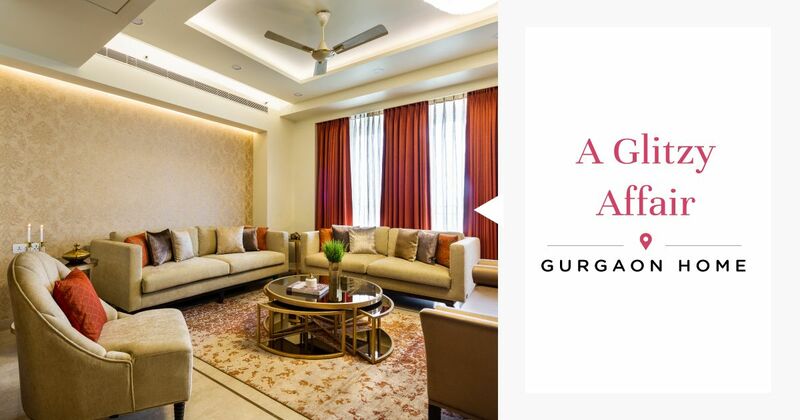 “Soumya and Tanvi wanted a living room with a nice ambience with the right lighting,” explains Sangeetha. 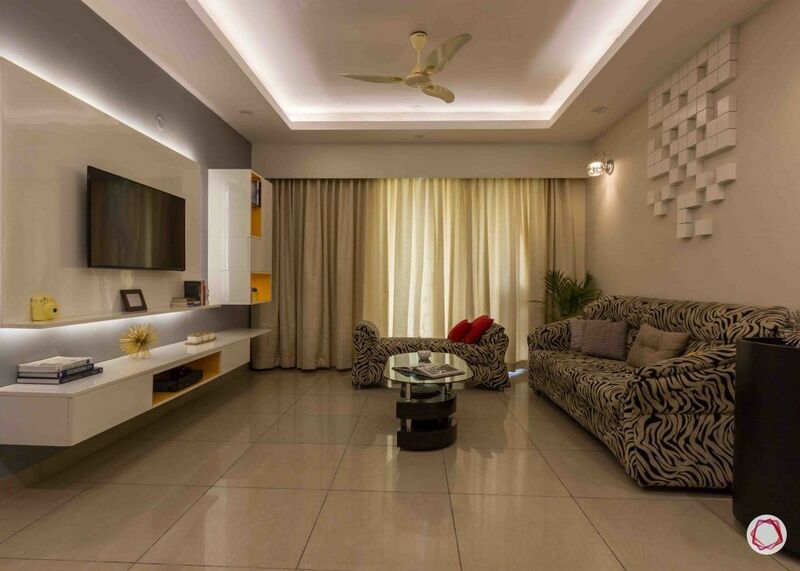 Therefore, the laminate-finished TV unit is backlit and the false ceiling too has recessed lighting. 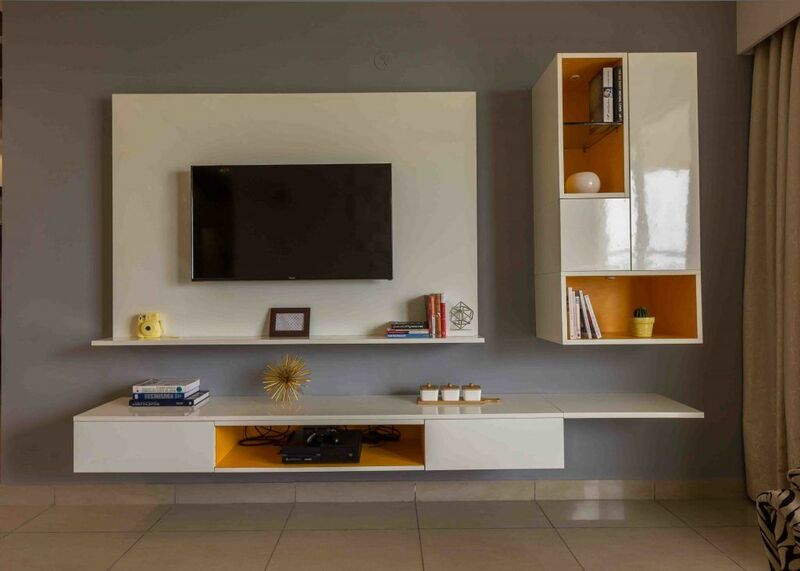 The pristine white TV unit and display cabinet with yellow open shelves are dressed with a coat of steel grey paint. 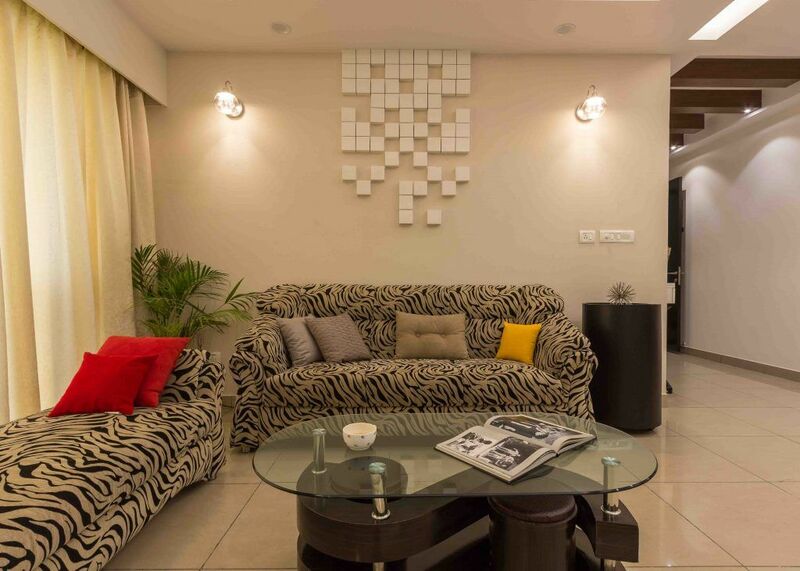 The look is complete with a sofa and lounge chaise in zebra stripes that was part of the couple’s original set of furniture. Notice the dark unit next to the sofa? 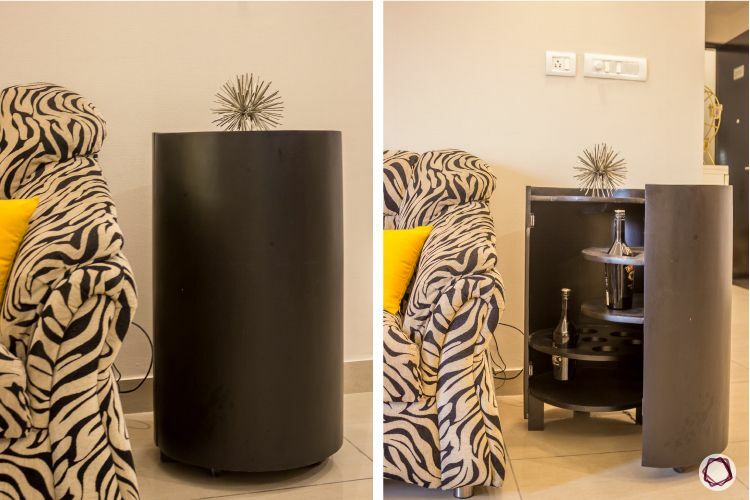 It opens up to a bar unit where the couple can stash wine bottles. 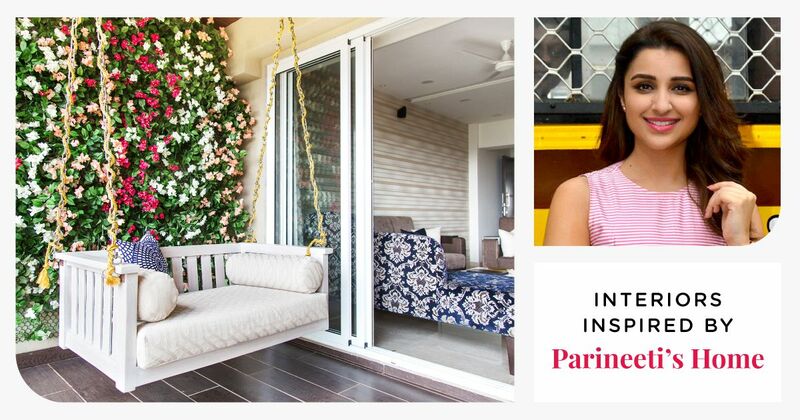 To create an illusion of separate spaces, Sangeetha put in a chic wooden partition that divides the dining area from the living room. This doubles up as a display unit as well with open shelves to feature artefacts. 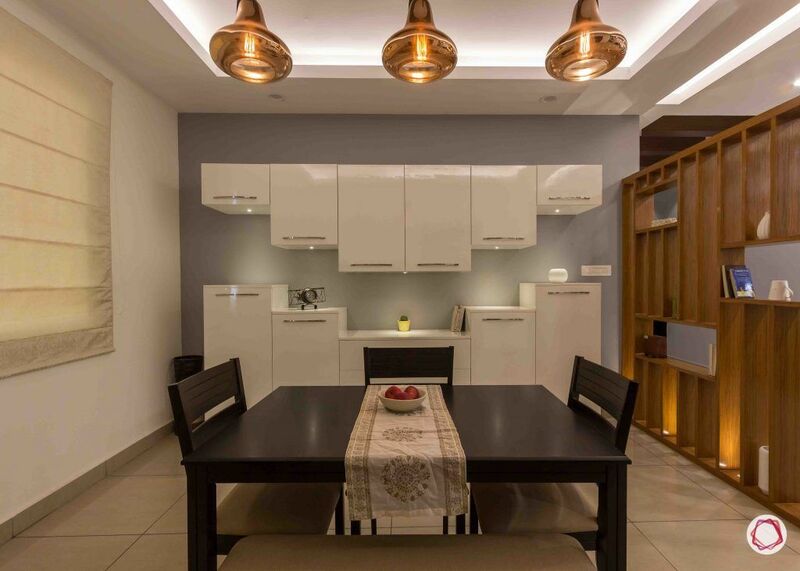 Since the young couple didn’t want a traditional crockery unit, Sangeetha crafted a step-like unit with storage overhead as well. 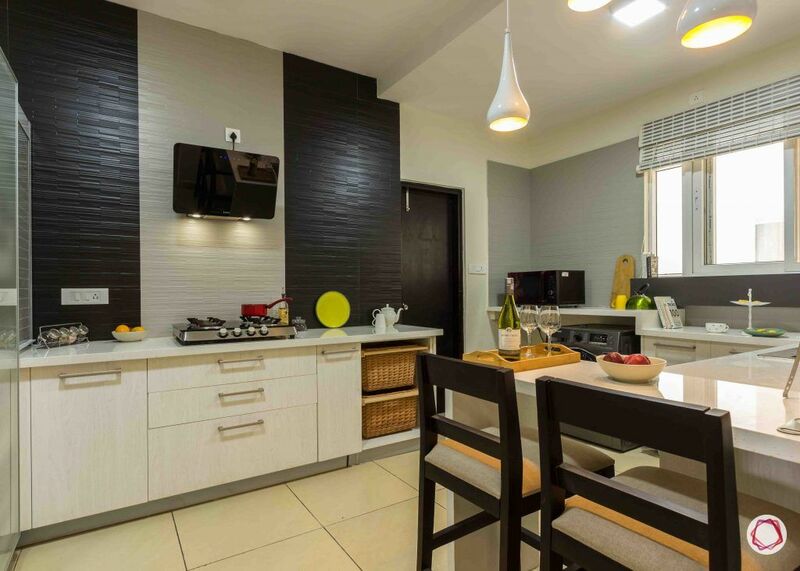 The pearly white laminate-finished element adds a bit of drama and dimension to the space. It also pairs well with the minimal dining set that was part of the couple’s furniture. 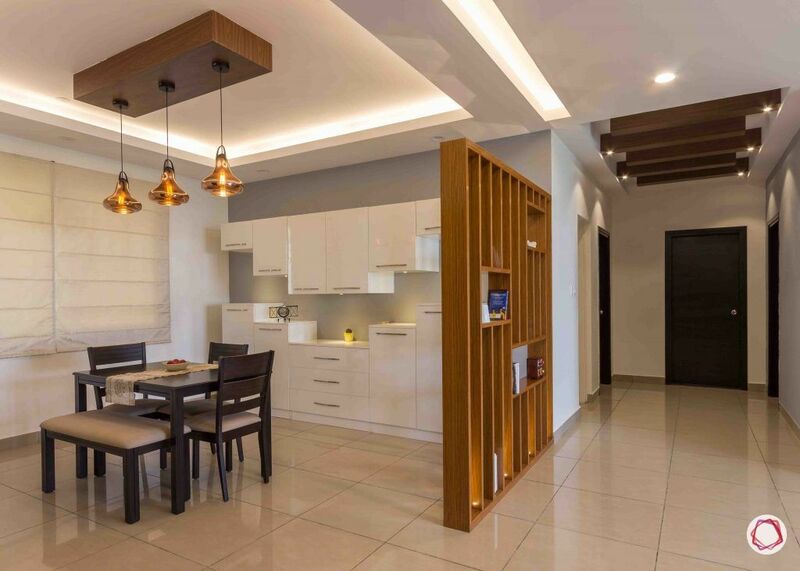 Just like the living room, the dining space too has beautiful light fixtures that help to create a cozy and warm ambience. 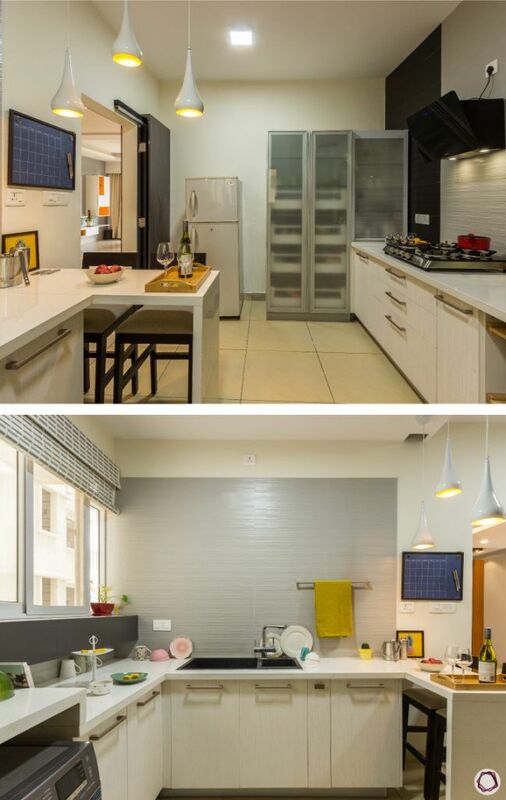 In keeping with the theme of the house, Soumya and Tanvi opted for a modern kitchen. 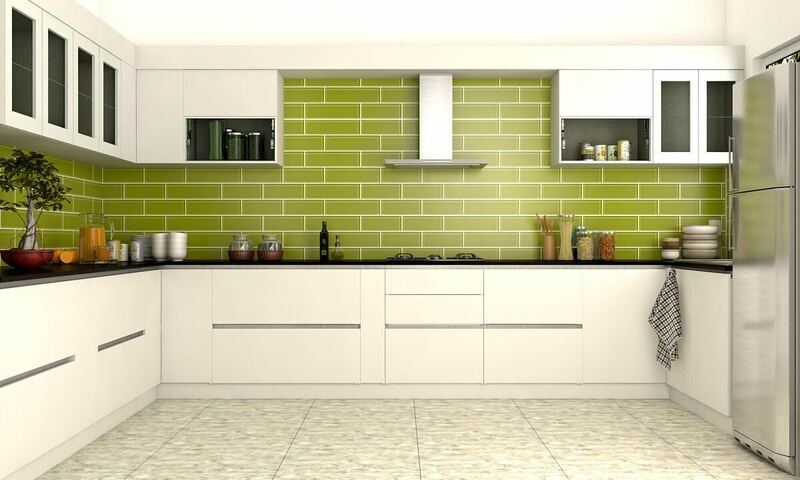 While the entire kitchen is doused in a pearly white facade, the centre wall offers a mix of black and white tiles. 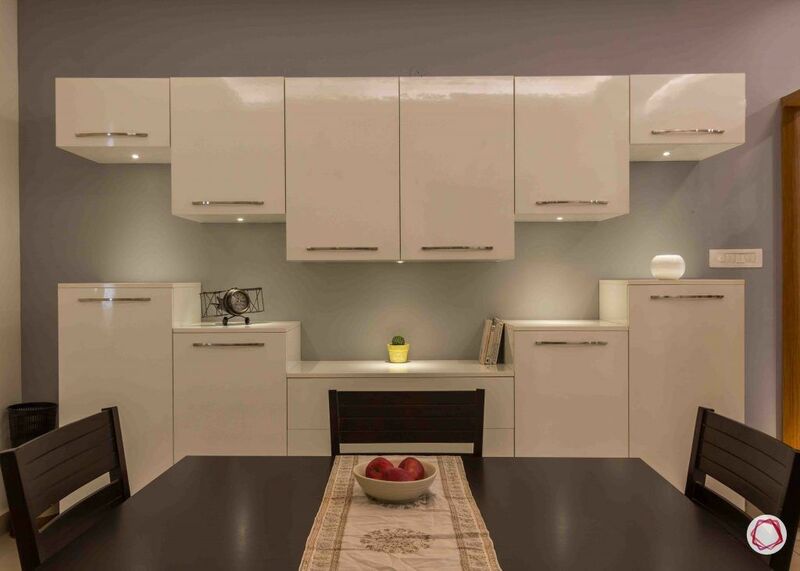 The couple also preferred base storage without the typical heavy wall cabinets. So, Sangeetha put in custom-made tall units for groceries and other bulk essentials. 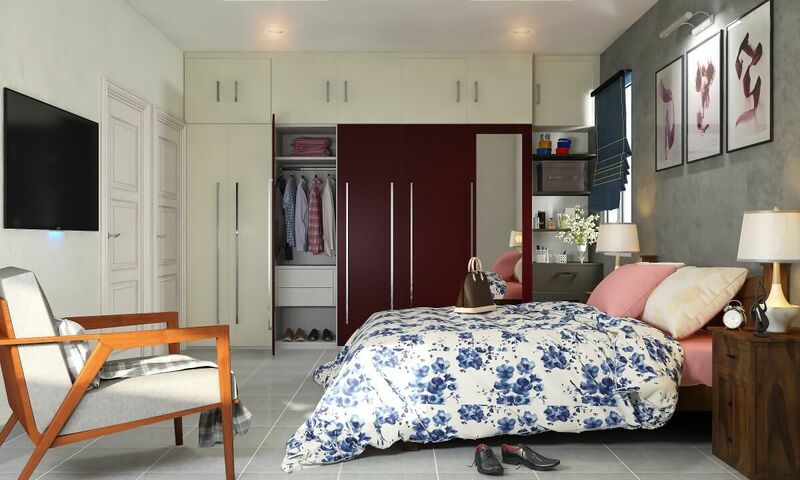 The tall units come with double doors, pull-out drawers and glass shutters for a sleek finish. 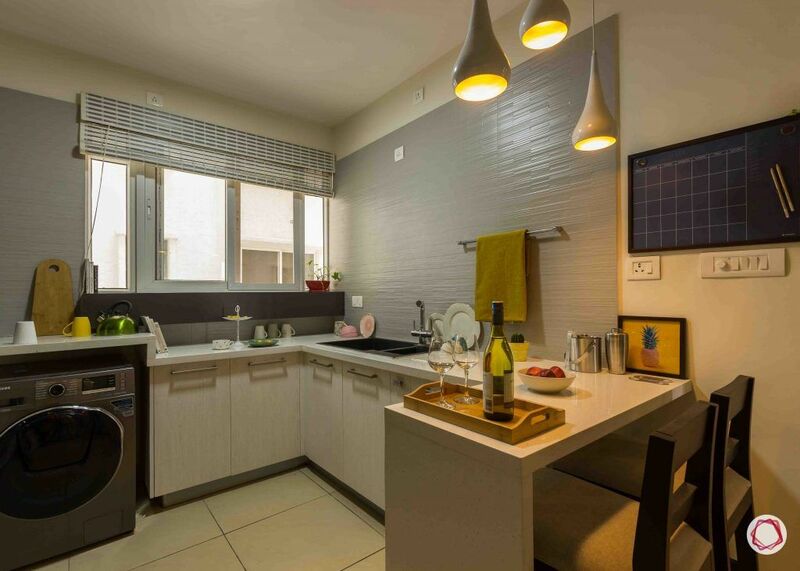 Just like the rest of the home, intriguing lights were an essential part of the kitchen as well. 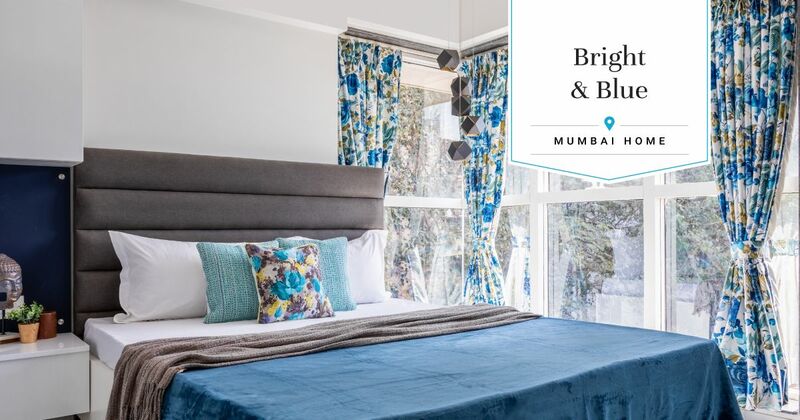 The tall unit features soft and warm lighting inside while the roller shutter for electrical appliances has blue lighting installed in it. 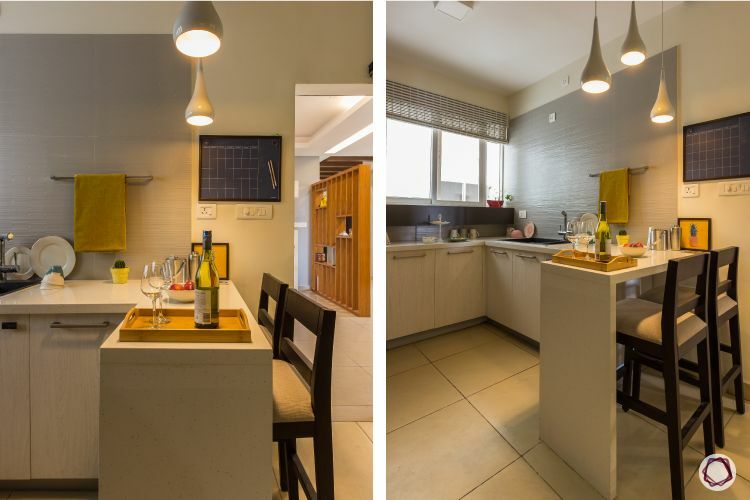 Sangeetha also put in a breakfast counter table with two cushioned chairs, making it perfect for breakfast on rushed mornings. The three pendant lights over the table elevate this corner into a intimate space. 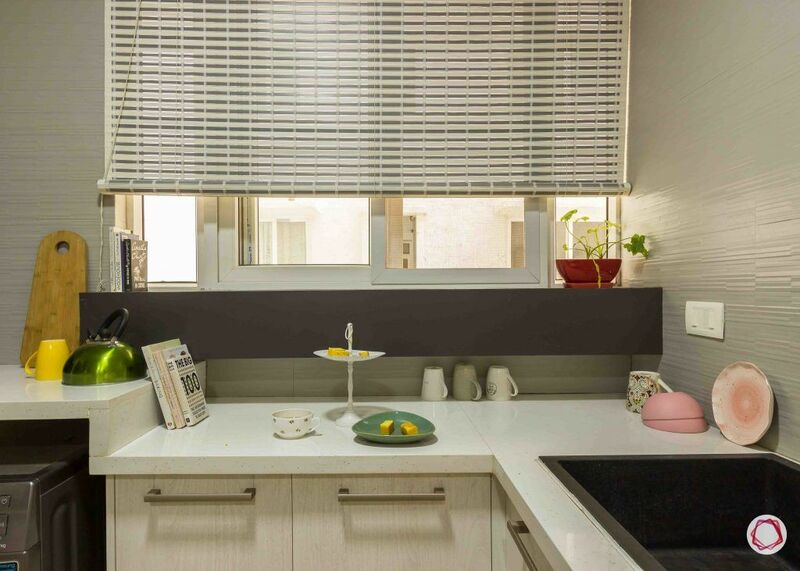 While the base cabinets have been done up in a membrane finish, the countertop is made of quartz kalinga for a smooth appeal. Don’t you love it? 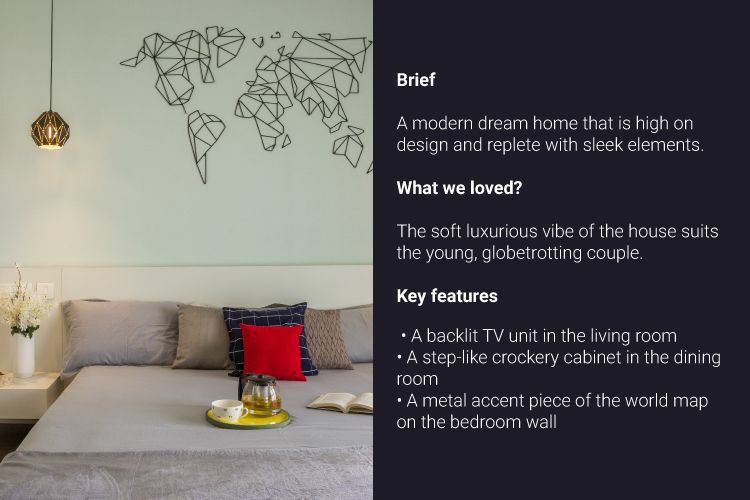 The master bedroom features several intriguing elements. 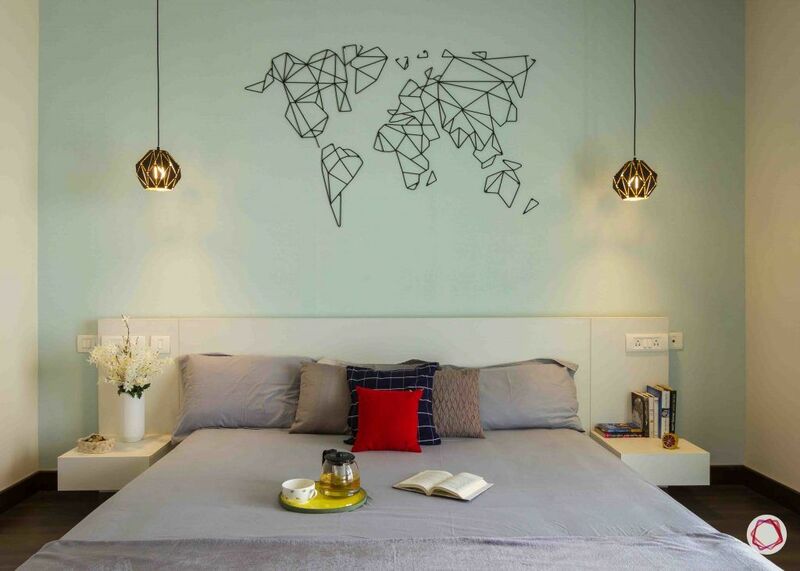 Of course, the highlight being a world map that’s been custom-made in metal. “We want to pin up Polaroids of our travels eventually,” explains Soumya in conversation with us. It’s planted on a sky blue wallpaper with subtle texture. 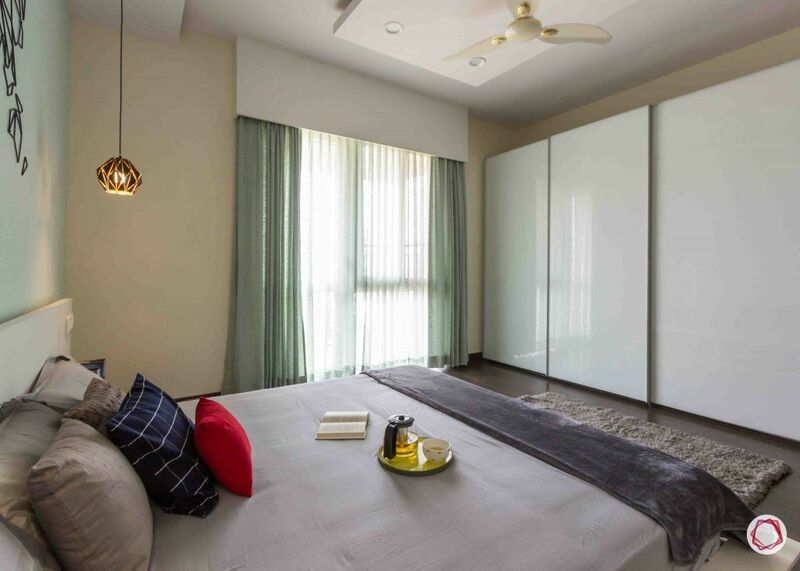 The white low floor bed and lacquered glass-finished wardrobe complement the dark wooden flooring. 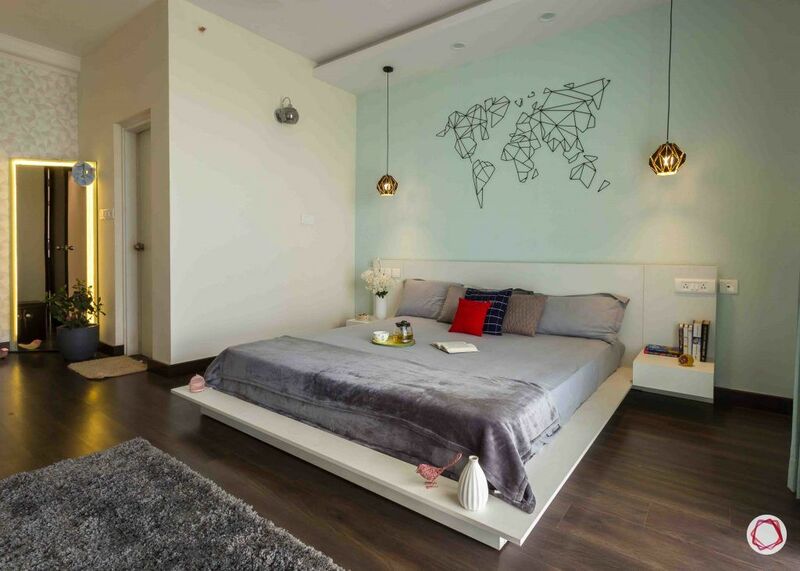 The laminate-finished bed has attached tables on either side to keep books and bedside essentials. Notice the drop lights? The couple didn’t want lamps to take up their bedside space. As a result, Sangeetha put in elegant drop lights on either side. In the other corner of the room, a subtle geometric wallpaper and full-length mirror will captivate your attention. The mirror has concealed LED lighting for its borders, adding the right amount of softness to the space. 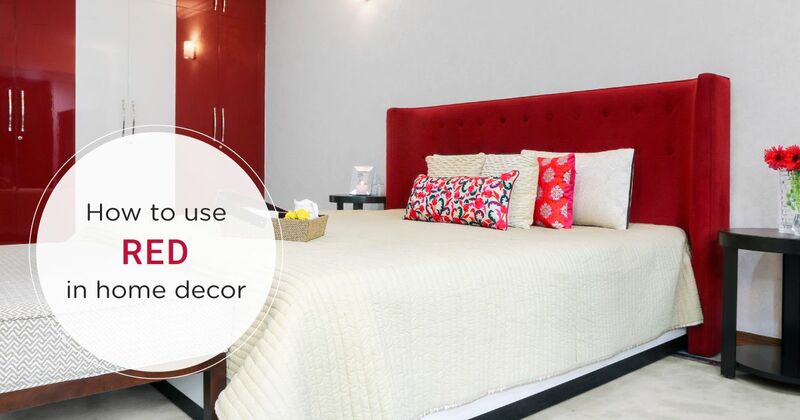 If you liked this home tour, take a look at Inside a Minimalist’s Soft Luxurious Home for more inspiration. 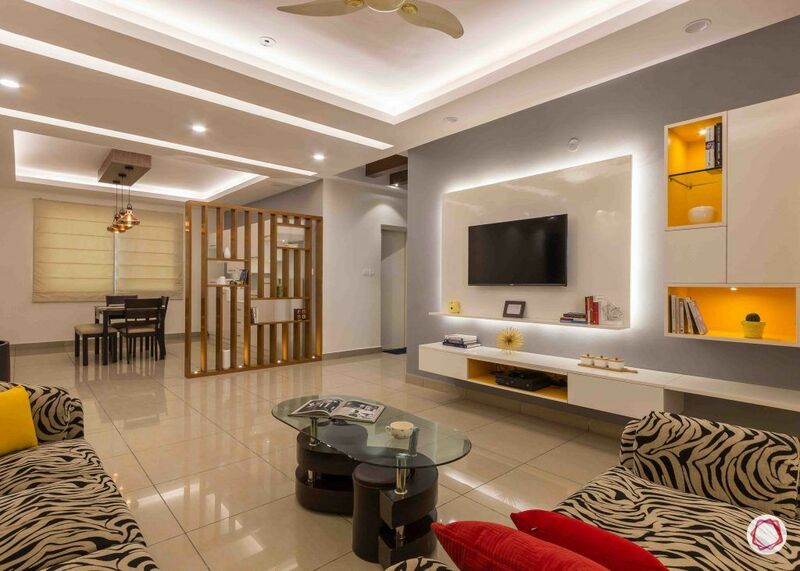 Liked the play of lights in this house? 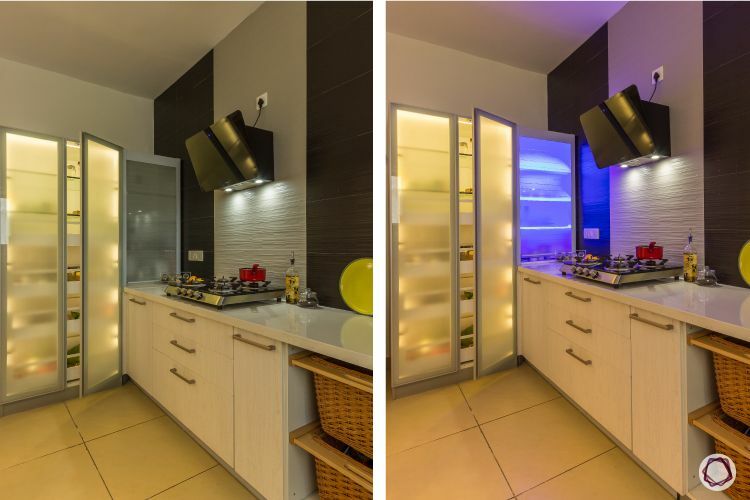 Check out 5 Amazing Lighting Trends that Will Suit Any Home.